Designer and mighty Tesco battle to get approval for first ever welfare label to go in new range of woollen clothes. Wool board veto being challenged. Savilerow-style helps organise the first ever press networking event for a group of bespoke tailors. At a glitzy event at the fashionable Mayfair Hotel, eleven of the finest from Savile Row and its environs met the media. Wonderful series shot on the Isle of Lewis has an all-star cast, that includes baddies, goodies and supporters. Despite the best efforts of one outsider, the famous tweed is once more back to its technicolour glory and selling well and in new fashion guises. An insider reveals the highs and lows of learning the craft before launching out on his own. 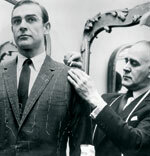 Another writer charts the highs and lows of the suit and its history - including James Bond/Sean Connery here being fitted by Tony Sinclair. Green baize tables, croupiers and eye shades take over at Huntsman, in a new role at this most glamorous of tailors. But its all in aid of charity. Latest centre for young Londoners is in the East End, where music, food, clubs, shops and markets provide the impetus for innovation and funky fashion. Beau Brummell's tailor reports rise in demand for db styles, as more formality and restraint reflects the current mood. And guidelines for those embarking on their first bespoke suit. Tony Rushmer reports from Sackville Street. Six-storey building off-Row is returning to its tailoring traditions, providing a centre for four tailoring firms so far and with more to come. Heir to family firm works to recreate the hub of his childhood. Classic shoes provide the right footing for a Savile Row suit.